Microsoft has taken the wraps off its new Surface Pro 4 tablet over at a press event in New York, with Panos Panay, Surface VP, demonstrating the hardware. The size of the actual device remains the same – save for the fact that it has got thinner, as you would expect, being shaved down to 8.4mm – but within that same frame, the screen size has been increased to 12.3-inches, with 60% more pixels on the screen compared to the Surface Pro 3. That makes for a 'PixelSense' display with a pixel density of 267 ppi. The thin layer of Gorilla Glass and refined touch engine apparently means the touchscreen is now more responsive, and coupled with improvements to the pen, makes for a slicker overall user experience. The new stylus has an eraser on the top, and can differentiate between 1024 different levels of pressure – there are even different tips for different tasks, such as one for drawing and sketching. 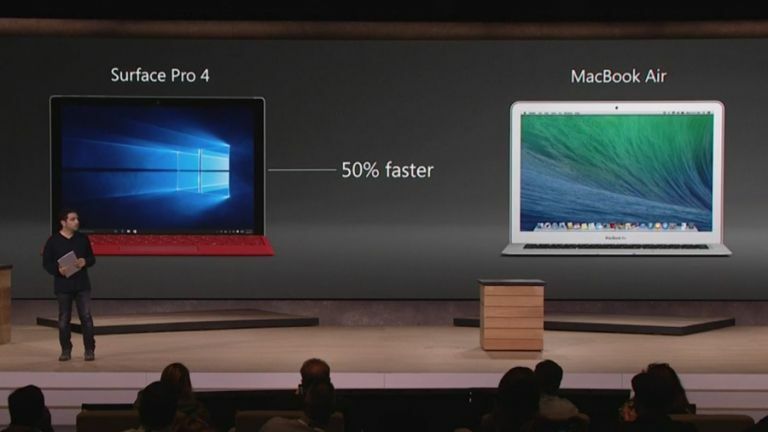 As for performance, the Surface Pro 4 is now driven by a Skylake CPU, and it's 30% faster than its predecessor, and Microsoft claims that its 50% faster than a MacBook Air. The new tablet also offers up to 1TB of storage and 16GB of RAM. Redmond showed off a new Type Cover which is thinner, has a 40% larger trackpad, and new keys with an improved typing action. There was also a new 'Pro' docking station with two 4K DisplayPorts, four USB 3 ports, and an Ethernet connection. These will work with your Surface Pro 3, by the way. The company also introduced the Surface Book, a nifty-looking machine which it billed as the “ultimate laptop”, with a 13.5-inch screen that has a pixel density of 267 ppi, and the same PixelSense technology as seen on the Pro 4. While it does indeed look like a full notebook with a stylish machined aluminium body, the Surface Book is actually a convertible, as it has a 'dynamic fulcrum' hinge which allows for the release of the screen – the display simply slips off easily, so you can use it as a tablet. Microsoft said that this is the fastest 13-inch laptop ever made, and that the Surface Book with its Skylake processor and discrete GeForce GPU is twice as fast as a MacBook Pro (presumably the base model). He also showed the laptop playing Gears of War very briefly, and it seemed to be running fairly smoothly. Microsoft is claiming a 12 hour battery life for this piece of hardware. The new Surface Pro 4 starts at $899 (from £895 in the UK), and the Surface Book kicks off at $1499 (around £985, no word on exact UK pricing or availability), with an on-sale date of October 26. Pre-orders are set to begin tomorrow. Microsoft will certainly expect to sell a fair few of these devices, and Terry Myerson, who introduced the event, said that sales of the company's tablets have doubled in the last year. What has Microsoft got in store for October 6?